While Lee Majors was home eating his lunch, the two pretty girls in his life were out together shopping for a present for his son. The girls were so young, so fresh-faced and so compatible that they might have been mistaken for a pair of sorority sisters from nearby UCLA. Obviously they had a great deal in common. But the bond that held Kathy Yeary and Patti Chandler together wasn’t a little sorority pin. It was much more significant and surprising. The tie that bound them closely together was their love – past and present – for Lee Majors. Twenty-year old Kathy represents past love, for she was married to Lee and is the mother of his son. Twenty year old Patti is Lee’s present love, and according to Hollywood gossip, may shortly become his wife, although neither she nor Lee has confirmed this. Together, the two girls went shopping for a Christmas tricycle for Lee’s son, and as they searched the stores, they chatted happily about the Thanksgiving dinner they would be sharing a few days later. “Sure,” Lee said over his sandwich and a cup of coffee, “Patti and Kathy are friends. In fact, I’m going to have be away on Thanksgiving to be at the Grand Marshal of a parade in North Carolina, so Patti has invited Kathy and Lee (the baby) to have dinner with her and her family. I appreciate that. In Hollywood “civilized divorces” are fashionable, not uncommon. Former husbands and wives double date or even date each other, but even in Hollywood, Lee’s situation is unusual. Possibly, he’s the luckiest man in town. He has the love of one charming girl whom he seems to love in return, and he has the respect and good will of another to whom he used to be married. Further, as frosting on the cake, the girls apparently enjoy each other’s company which makes it very easy for Lee and Patti to see his and Kathy’s son without any strain. Lee and Kathy were married when she was a sixteen-year old high school student and he was in college. After a few years together they were forced to admit that youthful bad judgement, rather than undying love had united them, and so they were divorced. The decree was final last June at just about the time that Lee met Patti, but this was only a coincidence. Neither Patti nor any other woman contributed to the breach between Lee and Kathy. Young Lee, who is three years old, calls Patti by her name and simply accepts her as one of Daddy’s friends, as well as a friend of Mama’s. Lee’s smile has a faint wistfulness as he thinks of his son’s babyhood. Young Lee was born during what should have been his mother’s senior year in high school, but pregnancy had forced her to drop out. His father was still in college, so the baby’s first home was a meagre apartment which the school provided for married students. 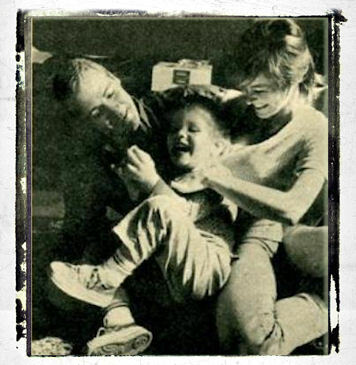 During their son’s babyhood, Lee and Kathy spent a great deal of time with him. 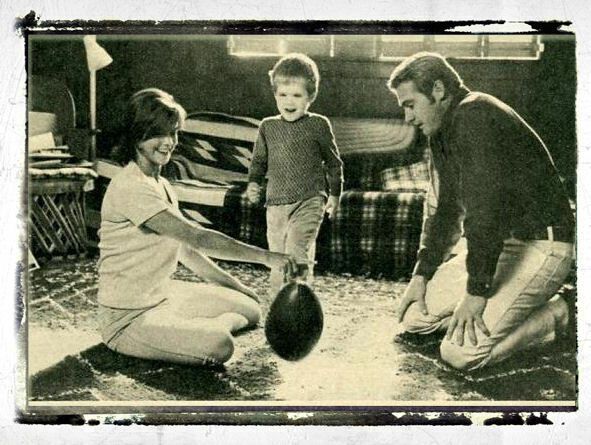 For an outing, Kathy would take young Lee to the edge of the athletic field to watch his father practice football. That was treat enough as far as Kathy was concerned, and the baby seemed to enjoy it too. “Daddy,” he’d gurgle when big Lee came to the sidelines to see them. It wasn’t long after this, though, that Lee’s marriage to Kathy began to dissolve. Upon graduation, Lee transferred his family to Los Angeles and went to work as a park recreation director while he studied acting. He liked working with young people at the playground, in the same way that he’d always enjoyed romping with his son, but the work schedule at the park made family life difficult. Further, the job didn’t pay much, so he and Kathy still couldn’t afford a babysitter very often. They didn’t have money or time for fun. They seldom had an opportunity to be alone together. When they were together, they so often disagreed that at last it became obvious that their differences, which had seemed small on college campus, still existed and were growing. Even the baby could feel the tension between them. Adolescent infatuation, they were learning with heartbreak, was not the same thing as love. Separation – divorce – seemed inevitable. Yet Lee and Kathy made every effort to keep their marriage in tact. When they could they “dated” each other, pretending nothing much had changed since the happy days in the college town of Richmond, Kentucky, where they’d first met and begun their married life together. 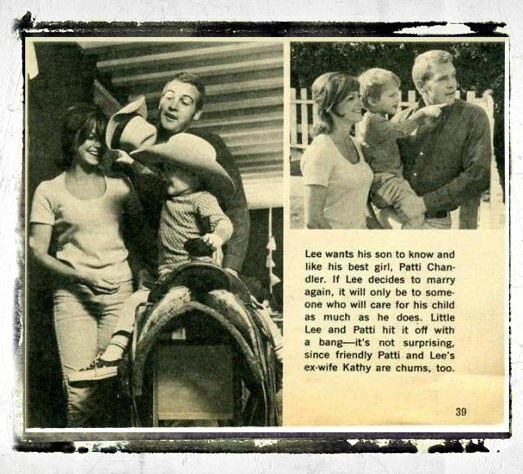 Ultimately, Kathy was the first to admit to the fact that her marriage to Lee had been a teenage mistake and, although he was forced to agree with her, he tried desperately to escape from the truth. “Maybe we can work things out,” he said hopefully - but they couldn’t. The pressures and tensions of their marriage were not only destroying Lee and Kathy, they were hurting the baby. And so the parents parted to become, happily, good friends. As man and wife they’d failed one another, but outside of marriage they succeeded in liking each other a great deal. Lee and Patti met each other on a blind date which wasn’t a rousing triumph, at least not in Patti’s opinion. At the time, “The Big Valley” hadn’t got on the air and Lee was certainly still a nobody as far as the vast public was concerned. Hollywood parties made him nervous, as did real live actresses who had contracts with studios, and his first date with Patti was an unnerving combination of the two. Lee was so self-consciously silent that Patti decided he didn’t like her and determined that if she never saw him again that would be soon enough. However, they did have a second date which allowed Patti to discover how wrong she’d been about Lee’s feelings for her and for that matter, about her feelings for him. Lee’s reluctance to marry again right away probably has a double origin. In the first place, the failure of his marriage to Kathy was such a wounding experience that he hasn’t entirely recovered from the shock of it. Secondly, he is deeply concerned about the welfare of his son, and until young Lee’s future is clearly determined, big Lee might not have he heart to establish a second home. Lee knows Kathy is a wonderful mother. He doesn’t have to worry for a second about the way she takes care of his baby. But he is worried about Los Angeles. The big sprawling city with its dozens of crowded suburbs is a poor place for a boy to grow up, Lee thinks. It’s not a bit like his hometown, Middlesboro, Kentucky. “I think Kathy will take Lee away from here, away from me, and go back home,” he says. “I hope she will. I may not get to see him as much, but I’ll get back there fairly often. And, I want him to have the things he can get there that he can’t get here. I want him to be able to walk to school like I did, without the threat of heavy traffic and some of the other things that exist in Los Angeles. “It’s dangerous here for a child to walk more than a few blocks to school, and even a few blocks can be bad. Back home, walking to school is not only safe, it was fun. I used to look forward to it – chucking dirt at cows along the way. Things like that. I want my son to have the kind of security and fun you find in a small town. Lee knows how important love and security in a developing a child’s personality, because although he had plenty when he was growing up, there was a time when he thought he was without both. Reading an old newspaper in the attic trunk, Lee learned when he was thirteen, that he was adopted and that the man and woman he loved and whom he thought of as his parents weren’t his mother and father at all. The stunning revelation knocked the bottom out of Lee’s world. He told himself that his life, his identity was a lie. Nothing that he’d believed in existed. There was nothing to hold on. Lee’s shock was so great that he couldn’t even tell his adopted parents that he’d learned the truth about his birth – that his real father had been killed before he was born and that his mother had died in an accident soon after. For five years, the hidden knowledge nagged him like an ulcer until, finally, he told a friend his dreadful secret and, in someway, the word got back to his mother. Then, at last Lee was able to talk about the shock of that he’d suffered and the doubts that had followed. With frank discussion of the truth there came a healing to his spirit. He realized that the man and woman who had raised him were his parents in the truest sense, because he had never, since babyhood, been without their love and support. As a result of his own experience, Lee is determined to maintain a solid, sustaining relationship with his little boy. He wants young Lee to always know that while his mother and father may not love each other any more, they love him dearly. He wants him to know Patti and to like her but, at the same time, he wants young Lee to be sure that neither she nor anyone can ever threaten a father’s love. 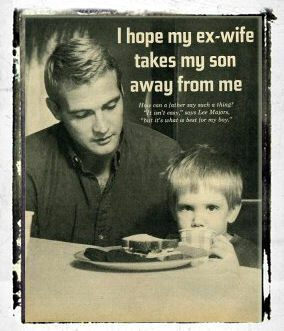 If Lee should marry again, it will only be to someone who will care for his child almost as he does. No woman in Lee’s life will ever cost his son an ounce of love. Rather, she will be one more person to give the little boy security and devotion.